TV show dates: October 10, 2018 — present. Performers include: Daniel Ezra, Taye Diggs, Samantha Logan, Bre-Z, Greta Onieogou, Monet Mazur, Michael Evans Behling, Cody Christian, Karimah Westbrook, and Jalyn Hall. 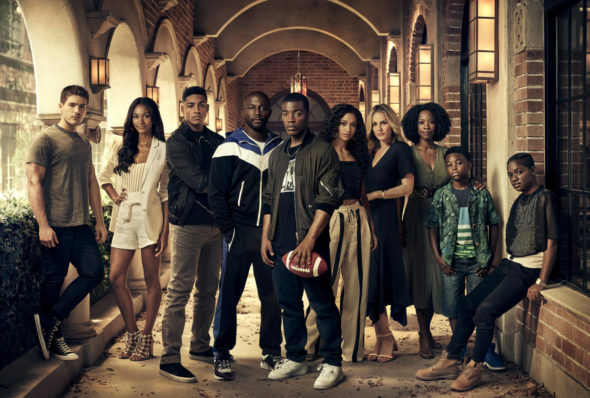 From creator and executive producer April Blair, the All American TV show is inspired by the life of NFL player Spencer Paysinger. The story centers on Spencer James (Ezra), a rising high school football player at Compton’s South Crenshaw High, where he is an A student. When Beverly High School’s football coach, Billy Baker (Diggs) recruits Spencer to join his team, Spencer’s mom, Grace (Westbrook), and best friend, Coop (Bre-Z), encourage the young man to grab hold of this new opportunity. While Compton is home to Spencer, he decides to make the move. Once he transfers, Spencer has to learn how to navigate between his south side community and wealthy Beverly Hills, which just may provide him with some big opportunities. To remain at Beverly High though, he has to move in with Billy and his family, in order not to void his transfer permit. Jordan (Behling) is not just Beverly’s starting quarterback, he’s also Billy’s son. He’s not exactly enthusiastic about sharing either the spotlight, or his dad’s attention, with this newcomer. It’s not easy for Spencer to settle in, but when Jordan’s sister, Olivia (Logan) befriends him, he feels less isolated, even though she has her own problems. When Spencer starts to fall for his new classmate, Layla (Onieogou), her boyfriend, Asher (Christian), is determined not only to shut down the fledgling crush, but also drive Spencer off of Beverly High’s football team and out of their school, permanently. Can Spencer adapt to and thrive in a whole new neighborhood and school, yet still manage to leave everything on the field? Does he have what it takes to make the most of all these changes and chances? Stay tuned. What do you think? Do you like the All American TV series? Should this CW TV show be cancelled or renewed for another season? This was exciting. It touched on so many aspects of Family and building relationships. Please RENEW! RENEW! RENEW! Please renew this series. I binge watched this show on Netflix and could not take my eyes off. When is the season finale going to be shown. I will be waiting for season 2 to come on. Please renew. Just binge watched this show and it is so good!!! Please renew All American! I love this show! Also when will this season’s finale be shown? Please renew this show. This is one show our family sits down and watches together. Great story line. Love the actors. Great show! Please renew!! We loved it!!! This show is phenomenal! The acting is the best story line is the best! Please keep it coming 10 more seasons. I am a mother of 4 Boys. We all enjoy to finally find a series that we Live together. Please do whatever it takes. We have so very many young boys who need this. I would love to watch another season! The show is so real and the acting is phenomenal! The show is great and the actors are phenomenal. I would love to see another season!